For the month of February, this book is for those who are married or wish to get married. 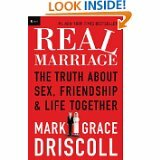 If you read Driscoll, this book might be too strong at times. Overall, it is helpful. To enter the giveaway, answer this question: what does marriage mean to you? Draw date: February 14, 2014. Marriage is to portray the union of christ and the church, how christ loves His bride by dying for her. And how the church submits to the headship of christ. Marriage consummates when Christ comes to take His Bride, The Church. It is loving your spouse just as Christ gave Himself for the church. Trusting that God sanctifies the covenant, along with the parties. marriage is union. marriage is love. marriage is sacrifice. marriage is God’s gift to humanity.